HOUSTON, Jan. 22, 2019 /PRNewswire/ -- Pason Power announced today that its Intelligent Energy Management System (iEMS)™ has been selected to provide autonomous control for the Eguana Technologies Elevate energy storage system. 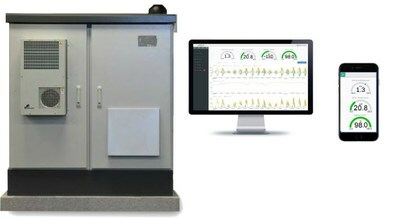 Pason Power's Intelligent EMS combines machine learning with real-time and historical data to optimize the value streams captured by Eguana's Elevate, an energy storage system for commercial and industrial energy storage applications. "With the integration of Pason Power's Intelligent EMS into our Elevate products we now offer our Commercial and Industrial (C&I) storage customers a powerful way to perform financial modeling based on actual equipment performance," said Brent Harris, CTO of Eguana Technologies Inc. "The computational complexity required to gain meaningful insight into the storage system is far beyond what humans can do, and we are very excited to bring machine learning from Pason Power to our customers." Pason Power's Intelligent EMS incorporates Internet of Things sensor data, weather metrics, energy market changes, load and generation data, and related information streams and factors these into its optimization algorithms to make actionable recommendations and predictions about when and how to leverage energy storage. Anyone evaluating Eguana storage systems can easily model their storage needs with Pason Power's Storage Architect™, a tool that allows customers to deploy solar and energy storage with confidence. Storage Architect significantly reduces the risks to asset owners, installers, and financiers of over- or under-building storage systems because it leverages the same data backbone used by production systems. "Machine learning is ideally suited to perform energy storage value stacking in real-time, and with this integration, Eguana customers can go from pencil-out to power-on very quickly," said Enrico Ladendorf, managing director of Pason Power. "Intelligent EMS users reap the benefits of complex computational analysis without the need for a data scientist. Storage developers and solar installers can be confident that storage system data modeled by our products accurately represent how their Eguana systems will perform in the field." Pason Power enables customers to build, sell, operate, and support advanced energy storage systems through its energy intelligence software platform. Pason Power customers can confidently right-size and model the financial performance of energy storage projects to significantly lower project risk and confidently move from pencil-out to power-on™. The company is built on a legacy of over 24 years in the management and security of energy data. The company is backed by its parent company, Pason Systems Inc. (TSX: PSI), and leverages robust, industrial technology which has established it as a world leader in energy data management and controls automation. Pason enjoys one of the strongest balance sheets in the industry and has a 40-year track record of adding value through energy data. Pason Power solutions are compatible with industry-leading storage components and enable energy storage systems that reduce costs for end users, serve as reliable grid assets for utilities, and let developers deploy storage systems of all sizes with confidence. For more information, please visit https://pasonpower.com/ and follow us on Twitter @PasonPower and LinkedIn pason-power.